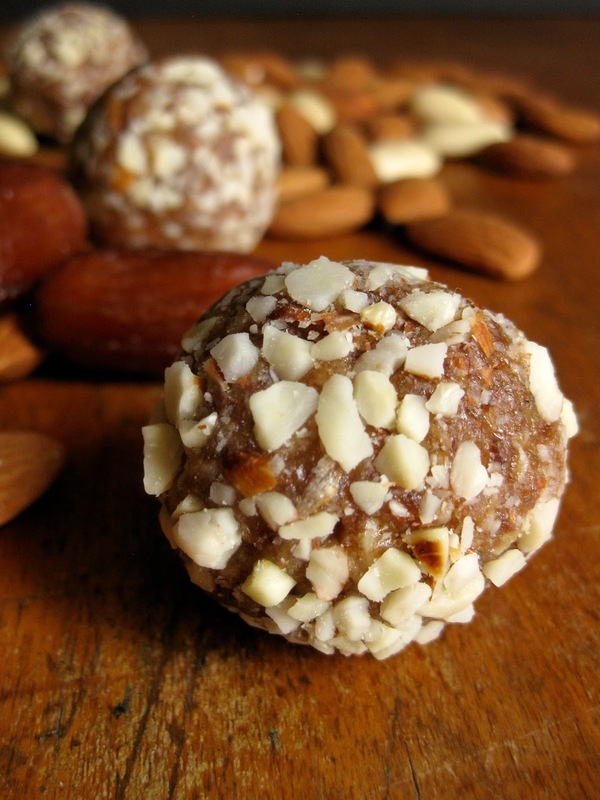 This easy healthy dessert recipe makes a great paleo snack. This easy recipe makes it onto my list of healthy desserts for the hot summer months because there's no baking involved (ahem, except for toasting the almonds, which you don't *have* to do). A recipe follows. But in general, you simply combine ground almonds (or any kind of nuts), and dates with a little vanilla, cinnamon, and salt, and you end up with a tasty and healthy dessert (and paleo snack!) that isn't too sweet. You can use honey (or a vegan sweetener of similar consistency, like maple syrup) if you need to, but the dates tend to be sweet enough. These paleo cookies work well in a packed lunch or eaten at a potluck, but they're also a great high-energy, healthy snack to take on day hikes; they're packed with potassium, fiber, protein, and (healthy) fat. In other words, they pack enough "oomph" to help keep you going and feeling full, whether you eat them as fuel for a workout or just to kick off your day. They're essentially little, no bake, homemade, bite-sized energy bars. And, if you're looking for paleo diet foods, you should add these to your folio of great paleo cookie recipes! This date balls recipe would also work well as a healthy Thanksgiving dessert or appetizer. Equipment-wise, you'll need a food processor. Just throw the ingredients in there, give them a spin, and roll the dough into bite-sized morsels. It's quick, easy, and the last step is kid-friendly. Mini food processors won't do, though. There's only so much they can handle, and I learned that dates are not on the "can-handle" list. My mini died halfway through that struggle (with a very sad popping noise and some smoke). "Rustic" best describes the resulting chopped date ball mixture. 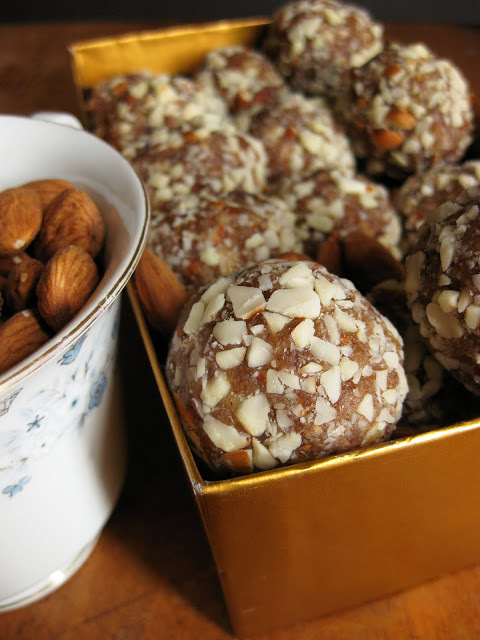 These paleo sweets, made with almonds, honey, and dates are an easy healthy dessert recipe. 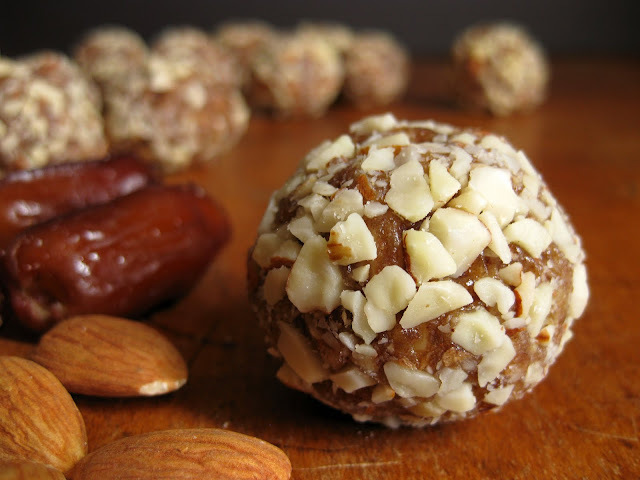 This healthy date balls recipe is easy to make, and makes great paleo snacks. Variations: Explore new flavor combinations by using different types of nuts (pistachio, walnut), adding citrus zest (1 tsp of orange or lemon), or different spices (1/4 tsp ground clove, cinnamon or cardamom). Notes: A friend was able to find the medjool dates that had evaded me and she tried these out herself. 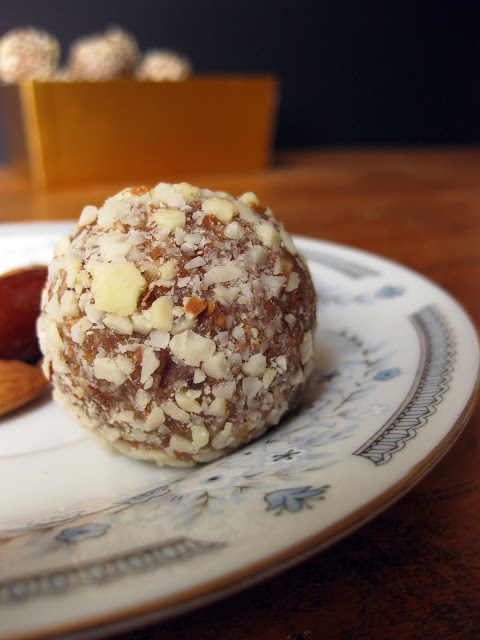 She commented that with medjool dates, the date ball recipe was so moist that she didn't need honey and she still found it to be sweet enough. She also coated the treats with a mixture of crushed toasted walnuts, orange zest and cinnamon for a delicious flavor combination! Using Deglet dates, I found that a 1/4 cup honey (equal to 4 tbsp) wasn't too sweet. However, reduce honey to match your own preferences. For every tablespoon of honey you omit, you may want to add 1 tsp water to make up for lost moisture. 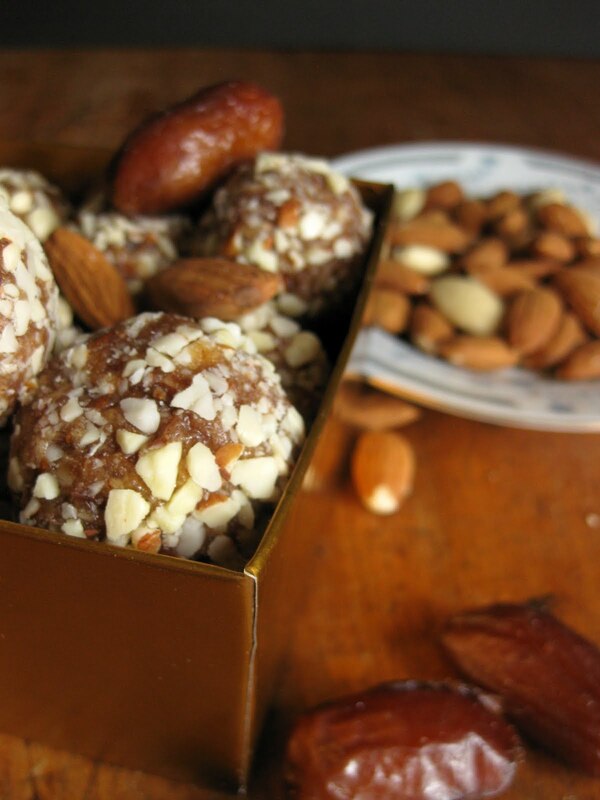 1) You don't have to toast the almonds, but it really intensifies and improves their flavor. To do so, spread on a baking sheet and toast almonds lightly in oven (350 F for about 5-7 minutes). Careful not to over-do otherwise they'll take on a bitter taste and burn. They should become fragrant and barely change color. While you're waiting, you can roughly chop the dates (helps you discover any pits, and preps them for the food processor). 2) Place half of the toasted almonds in a food processor, and pulse until finely ground. Remove them from the food processor and set them aside. 3) Place the remaining whole toasted almonds in the food processor. Pulse until finely ground. Throw the chopped dates in the food processor along with the remaining ingredients (honey, vanilla, cinnamon, salt) and process until the dates are finely chopped and ingredients are evenly mixed. 4) Coat your hands lightly in vegetable oil, and shape the date balls into walnut-sized pieces. Roll them in the finely ground almond, and set aside. Enjoy! These bit-sized morsels are perfect for an on-the go snack. Mmmmm! I hope you enjoy these healthy snacks! i would recommend soaking the dates.. they didn't pulse into a paste easily. I used a cookie scoop to make the balls and they turned out great.